...and the flower farm has been graced with an abundance of blooming peonies. ...a fiery fuscia variety, and a variety of small baby white ones. The house had been without flowers for too long. But soon our own garden will begin blooming and we'll have fresh cut flowers for months to come. Each flower is a verse in nature's enduring poem. I cannot wait to dwell on the beauty of each one. So beautiful and the way you have them displayed in your home - makes me want to eat them right up! 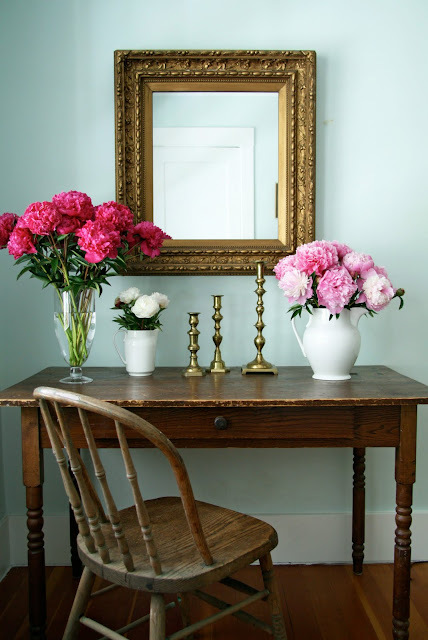 LOVE peonies. ps Where do you get your ladybugs? I need to order some. The aphids are having a hay day in my Hawthorne tree! I love peonies too! Your mirror, ironstone vase and brass candlesticks are fabulous. So very glad to hear the sunshine has come your way. This time of year walking through the garden is such a pleasure. Always something new to admire. I've been snipping a few here and there to bring into the house. The peonies you've cut are so beautiful. I really enjoy the way they look on your beautiful table. Peonies are one of my favorites. Love the hot pink ones. I adore peonies and just did two posts on the. Hope you can stop by My Dream Canvas. I love your blog!! 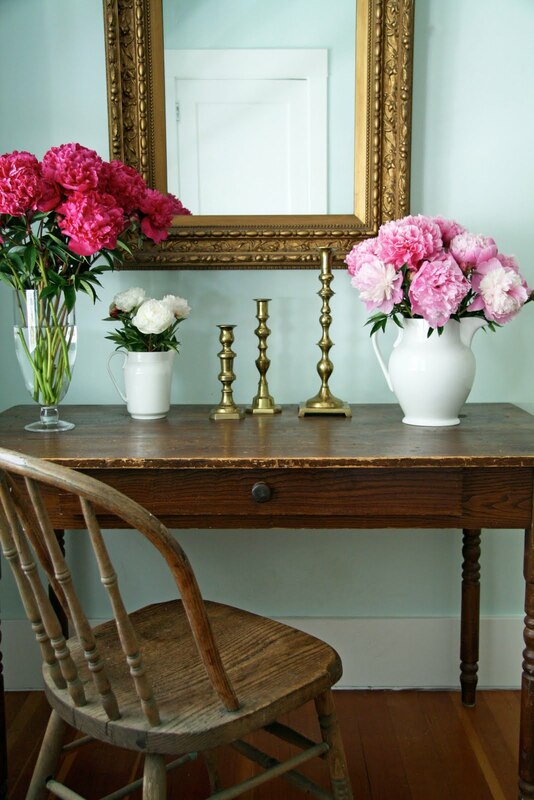 Peonies are absolutely on of my favourite flowers. In Tasmania we had a beautiful double pink peony tree it sat right at the front door and every year 13 dinner plate size blooms welcomed me when I came home! We can't grow either tree or herbaceous peonies here! 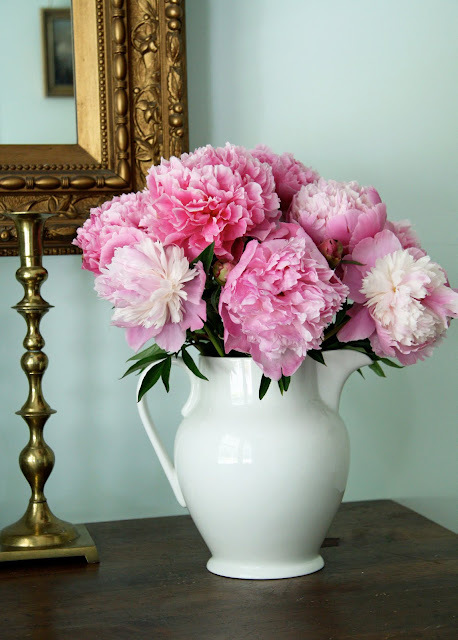 yummy peonies, they look stunningly gorgeous!! I ahve to wait many months beofre mine will be popping up!! Enjoy them.. 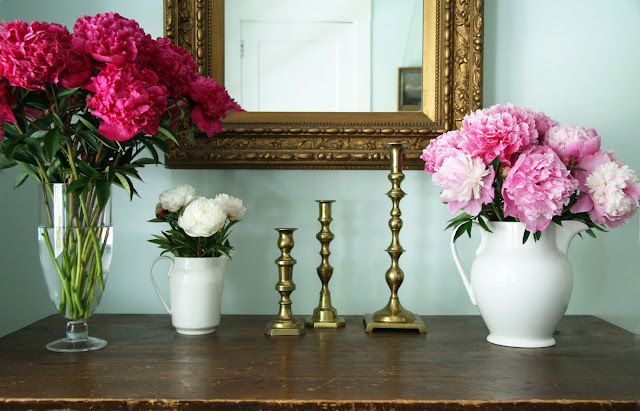 Your peonies are gorgeous. Mine are long gone - I wish they lasted longer. They are the happiest flowers! Sigh, ours are gone -- peonies bloom is all too short lived but they are among the prettiest of the flowers -- and fragrant as well! Love the flowers and display! Beautiful. They are so beautiful! It's amazing how this is your blooming time...I enjoyed the last of mine weeks ago, so this was such a treat!!! Love your words today, Trina! 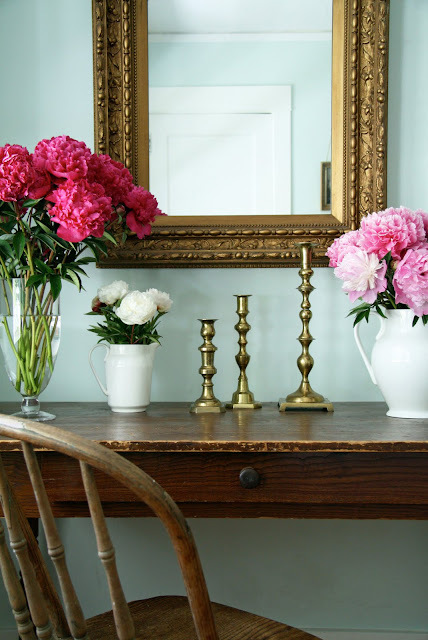 Of course, peonies will definitely prompt such written loveliness, won't they? Love , Love , love the flowers. Peonies are my new fave, but sadly we are moving and will be living in a zone where we can't grow peonies. : ( Guess I will just have to enjoy them on your blog. They sell sweet ladybugs at our local nursery. I've brought home many as I can't help but want to free them from their little bags!!! They are gorgeous! Do you have any advice on how to keep the pests out of them? Mine are always swarming with ants and I've heard they do something for the peonies and not to spray them. But then of course I can't cut them for inside because they all come out from in the bloom. It's Opal Essence by Benjamin Moore. I tried so many shades before finding this one - and we liked it so much we used the same color in our downstairs bathroom! I got these peonies from the local flower farm and it's funny, I didn't see one ant! But my peonies at home (which are just starting to open) do have ants on them. I've heard that the ants help make them open...so I've never tried to get rid of them. When I take cuttings inside, I just try and brush them off. again your photography and styling never cease to amaze me. i never tire of it and see something new each time you post. 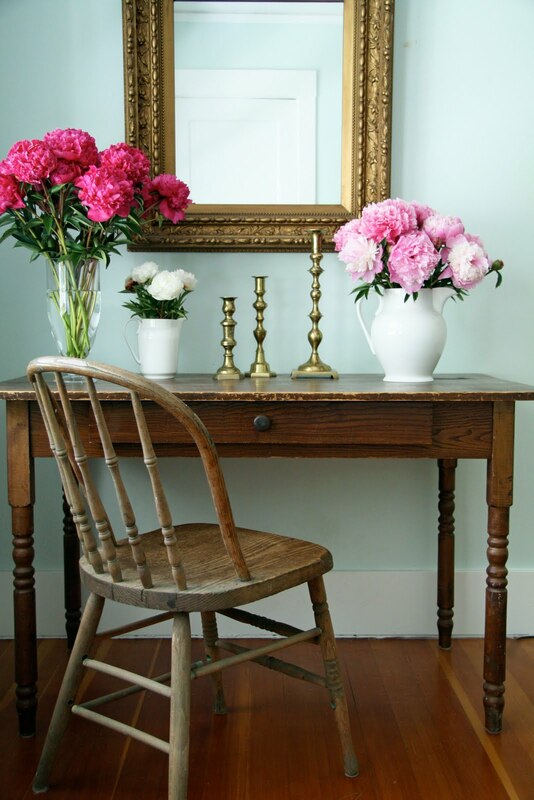 i adore the weathered finish on the desk juxtaposed with the elegant mirror and the simplicity of the flowers. gorgeous. ps ~ i've been waiting to see your bathroom wallpapered in that toile you picked, did you forget? cause i didn't! also, i remember why i really hate to wallpaper! So pretty, ours I think have come and gone for this year. And ours too had ants, they love our hydrangeas just as much. Absolutely beautiful :) One of my favorite flowers! Have a great day! Just discovered your blog today and what a fine! You had me at the first sight of the peonies. 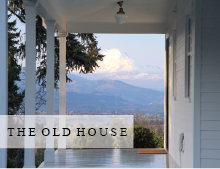 Such a great visit here...adore the farmhouse and all of your rennovations as well as the bautiful peek into the simple pleasures of country living. Trina...they are beautiful!!! And they look even more beautiful against the pale Robins Egg color on the walls, as do the gorgeous mirror, wood and brass elements that accompany them ...you've outdone yourself again! ps - I love that you rescue the ladybugs! I used to rescue them from the ants (and spiders) that kept attacking them when we put them on *our* hawthorn tree which was covered in aphids...ants farm them for the sweet juice they exude...and they were not at all happy that we brought the ladybugs to the party...pretty amazing! Love the pink and the mint. And the peonies smell like roses. 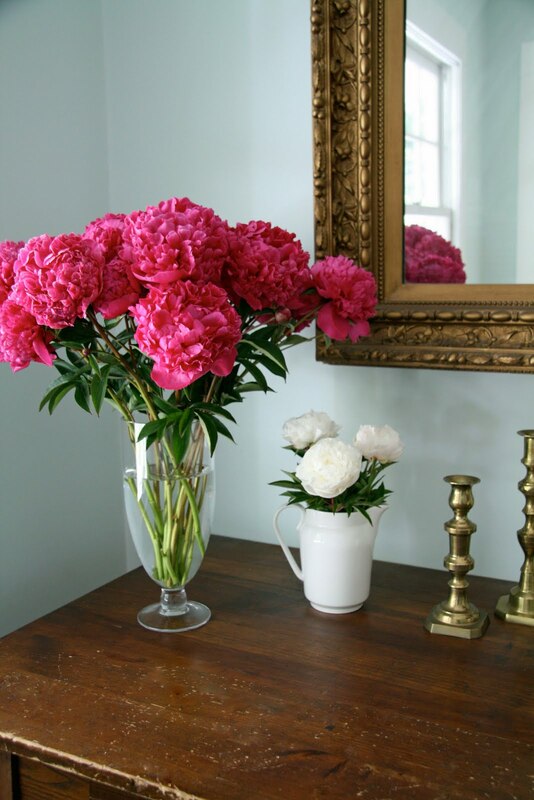 Love your peonies..each and every one! Opening your posts is like sitting down with a favorite new home magazine. I could stare at your photos for hours. Beautiful! Our peonies have been gone for almost a month now so thank you for sharing yours to remind me of their beauty! I am so jealous. i love peonies. It's cold, cold, cold here at the moment, with winter just tightening its grip. Will look forward to the spring. It's icy cold, grey & miserable here Trina, our Winter garden is bereft of anything colourful, so your peonies are such a treat to see. Just Beautiful. Love all the colors, especially the fuchsia, I wish we had a flower farm around here! I'm so behind on my reading. The beautiful japanese peonies you introduced us to must be really early ones. And I don't recall seeing this desk before but it's a sweet little arrangement. Peonies are my favorite!! Sadly in our current house we do not have an appropriate spot to grow them and I didn't get to visit my Grandmother's farm in time for the blooms this year. Thanks for sharing. They are SO lovely! The way the colors pop off of your blue walls is just beautiful! Lovely pictures. You have inspired me to get some more for next year. Those peonies are as beautiful as your words, Trina! There's something so breathtakingly timeless about the fluffy blooms against the watery blue-green wall.